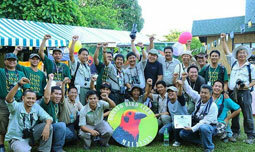 Birds Club International is constantly striving to improve people's awareness and knowledge about the birds that surround them. In order to effectively combat the increasing conservation threats now faced, it is vital that as many people as possible learn and appreciate how birds contribute to our life. By building awareness and imparting knowledge about birds through a variety of schemes, actions and activities at various levels on national and international platforms, Birds Club International will work to ensure that birds continue to play a paramount role in our cultures and remain an integral part of all our lives, being symbols of universal joy, love and peace beyond all barriers of regions, religions, languages and politics.